Usually we try to start off the school year on July 1st but we are waiting for some of our curriculum to either release or restock. Starting this way works well for our family since we school year-round and take breaks as needed whenever we want allowing for adventuring and traveling. For science, social studies, and history we usually piece together activities based on what is going on in our real lives or what the littles are interested in at the time. This year we will be trying out the newest release from Notgrass History, Our Star Spangled Story, so we’ll be honest how that plays out with our children’s ages and our unique lifestyle. 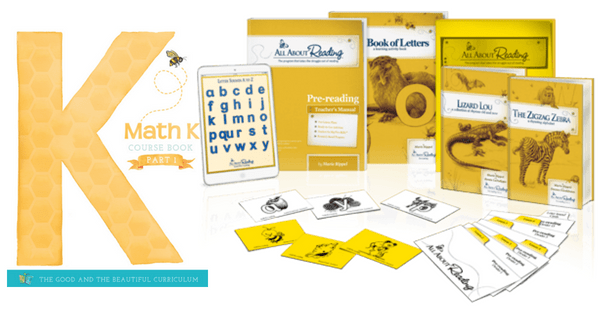 The Good and The Beautiful Math K – Newly released and hot off the press, this gorgeous program is full of images to be colored and faith-based writings which make connections to real life. All About Reading Pre-Reading – An interactive program that focuses on teaching capital letters, lowercase letters, and letter sounds while showing that reading can be fun. Minnie M colored a lot of this program last year with Wild Child but will be completing the program this year on her own to cement a good foundation. The Good and The Beautiful Math K – The same program and level that Minnie M will be working on but we’ll be more intentional and focused with Wild Child. Be watching for a review on how teaching both of them at once works out! 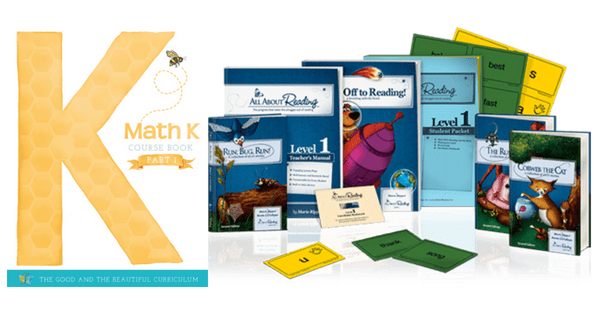 All About Reading Level 1 – It is no secret that I truly love AAR and their mastery-based programs and that love started right here with All About Reading Level 1. They work on phonics, fluency, comprehension, blending, syllables, and so much more using a multi-sensory approach that really broke through our eldest’s struggles. Instead of focusing on grade levels and what children “should know”, they focus on taking the time each individual needs and push to create passionate readers. Math for a Living Education Level 3 – Meant for ages 8 and up, this workbook continues with the story from levels 1 & 2 while teaching math skills in real life scenarios. In this installment, Charlie and Charlotte are headed for Peru! We’re invited to tag along as they review basic concepts and gain an understanding of why math is vital to living. All About Reading Levels 2 & 3 – Moving beyond early phonics level 2 begins focusing on reading fluency, comprehension, and retention. Princess is about halfway through All About Reading Level 2 (see our review) and then will move forward with Level 3 at her own pace. All About Spelling Level 1 – A complete stand-alone spelling program, level 1 focuses on teaching encoding and phonological awareness. We began working on this some in the spring and summer but will take more time for practice as the school year begins. The Good and The Beautiful Handwriting Level 4 – Filled with artwork, poetry, and Bible verses, this level cements early writing skills while also introducing cursive writing in words and sentences. Our Star Spangled Story – A newly released curriculum which we’ve added to our school year to review. Broken into 2 parts, Our Star Spangled Story focuses on everything from the first people in America to how we are making history today! Designed for grades 1-4, we’ll be using it with Princess while letting our younger two girls try to join in on the fun and stories. As you can see, joining our ranks in the “legally” homeschooling crew is Wild Child. That’s right, she’s officially a Kindergartener and registered! How it’s possible for us to be here, I have no idea, but alas she’s soon to be 6, and we’re really doing this thang. She’s beside herself with joy and I’m…well…adjusting to the idea of having two legal. Just wait, next year there will be three and I may have a breakdown. That’ll be fun! Haha just kidding, maybe; we’ll see. In all honesty though I am thrilled for the upcoming year and all of the possibilities that await our family. We’ve got some pretty exciting trips planned and a few major goals to tackle. There will be big things happening so be sure you sign up to receive those email updates! Are you ready for all of this? Because we definitely are!